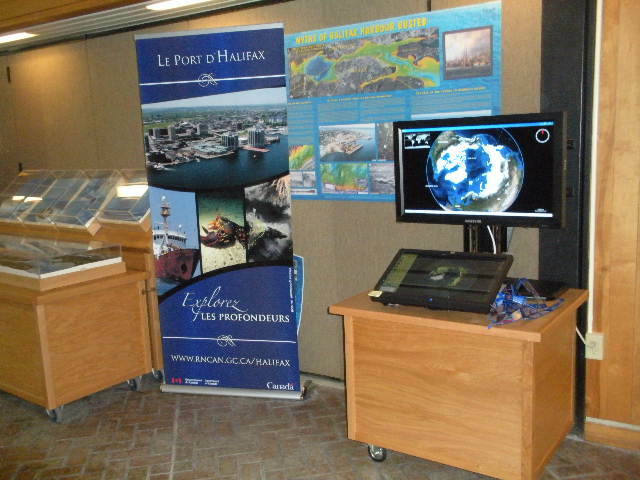 Tekmap Consulting recently completed a major upgrade to the interactive World Wind public access kiosks used by the Natural Resources Canada (NRCan) and the Fisheries and Oceans Canada (DFO) at the Bedford Institute of Oceanography. The kiosks provide public access to a wide variety of data and information supplied by the GSC and DFO. The data are displayed and accessed with an interactive 3D-globe and a user friendly menu system. The kiosk software developed by Tekmap Consulting is built on the World Wind Software Development Kit (SDK). The software also includes an embedded image viewer and video player through the VideoLAN (VLC) project. The kiosk hardware is a PC with a dual monitor setup. The primary display is a touchscreen monitor, and the secondary display is a larger 'TV' monitor. The user controlled touchscreen displays an interactive World Wind globe, with a simple menu navigation system. The larger TV monitor mirrors the World Wind globe, plus displays user selected images and videos. The Kiosk software developed by Tekmap Consulting also includes a menu builder/editor. The menu builder program allows the user to easily develop and edit kiosk menu files. Has the ability to run stand-alone without network access. World Wind can run using cached data. Incorporates high resolution client digital elevation data with background World Wind data (e.g. multibeam bathymetry). Overlays high resolution client imagery on World Wind globe (e.g. color shaded bathymetry, backscatter, sidecsan). Provides easy menu button access to user items (e.g. multibeam surveys->Atlantic->Halifax Harbour). Can display client images and movies (e.g. seabed photos, ROV videos). Is cross platform compatible (Windows, Mac OS X, Linux). Uses the interactive globe to provide easy "touch" access to geographically reference images, videos, and data. Key Markup Language (KML) files and menus. Simple click and go buttons to "fly" to a set location. Complex keyframe flights on the globe. Enhanced startup menu with easy access to configuration options. Single monitor mode, allowing the kiosk to run in either a dual monitor and single monitor setup. Added KML file support for sub-menus and menu buttons. Improved image and video support. Full HTML support (Windows and Mac only). Ability to embed menu files in each other. Contact us for more information on the World Wind Kiosk. Program updated on September 7, 2012. List of updates is given below. In the previous post, I described how to import multibeam navigation and bathymetry into GRASS using the wxPython Graphical User Interface (GUI). The r.in.mb GRASS/Mb-Stystem program is designed to import mbio compatible multibeam data directly into the GRASS GIS.